Is there really any need for words? Beauty has no need for words. I remember reading descriptions written by some of the first Spanish friars to have come in which they tried to describe the local flora and fauna. There was a description for “Nopal” as a plant that grew leaves upon its leaves. I would have had a hard time trying to imagine such a thing. 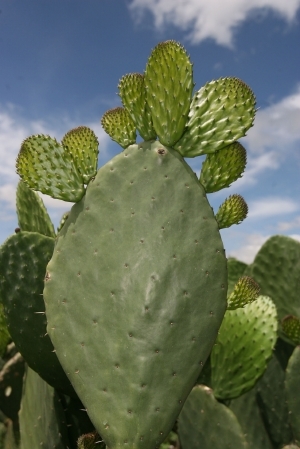 Nopal is the cactus in the picture, and by the way a wonderful tangy salad is made with it. They also described how the locals would mash it into a pulp and used it to wrap a broken bone with strips of cotton cloth, it would harden and hold the bone steadily in place until it healed, then eventually fall off on its own. I grew up around people who claimed to be returning to their “original” roots and embraced aztec traditions to their best of knowledge, which is nice, but as I’ve come to reflect more upon it I so love having two legacies that are both so rich! And admiring what was born from that mixture. In an attempt to preach to the locals they would allow the first mass of the day (maitines) to be sung in local languages. The locals would hide Deities of the local gods inside the catholic images that were built by them so they would still be worshiping their own concealed Deities. They had a Goddess named Tonantzin who was like their mother, so they related her with Virgen Mary and took quite readily to her. To this day most mexicans grow up worshiping her. In Ilhuicac is a prayer to Virgin Mary. This song is also in náhuatl, the music is by Gaspar Fernández, who was originally from Portugal but lived most of his life in “the new world” and was the Kapellmeister of the Cathedral of Puebla de Los Ángeles for 25 years until he passed away. It is a lullaby, xicoxi means “Go to sleep” parts of it are in latin.